Welcome to the wonderful world of Michtim: Fluffy Adventures. 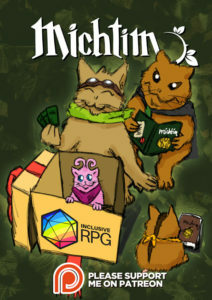 A unique roleplaying game that wants to be the happy, welcoming place for all sorts of gamers. Gamers are creative, imaginative folks. Taking up this hobby has allowed me to become a creator myself. Let’s make this world a better place by fostering imagination and togetherness. Are you looking to get your kids into tabletop roleplaying? Are you here because you’re into cute creatures? Do you look for an ethical game that’s promoting a non-violent message? If so, check out this short Michtim video review by Roleplay Roulette. If you want to charge head first into the game but don’t want or can’t spend much on the game, a pay-what-you-want option is available from times to times. You can always ask me on Twitter @GeorgMir. I do giveaways if you care to ask. I’m looking for a new way to create content for my game. If you like what you saw, please consider becoming my patron and supporting my cause. I will create new Game Design Theory, content for the game, Illustrations, Comics and will even do commissions (if you pledge for them). Michtim: Fluffy Adventures is a cute game. If you like cute things, you can help me out by buying merchandise. 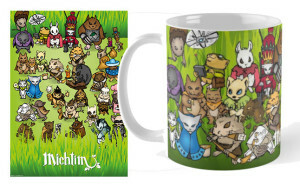 The quality of the Redbubble products for Michtim: Fluffy Adventures is amazing and the folks over at All Rolled Up are doing an excellent job at creating amazing dice rolls. Please also check out my Twitter. I try to promote an inclusive stance on all sorts of design.